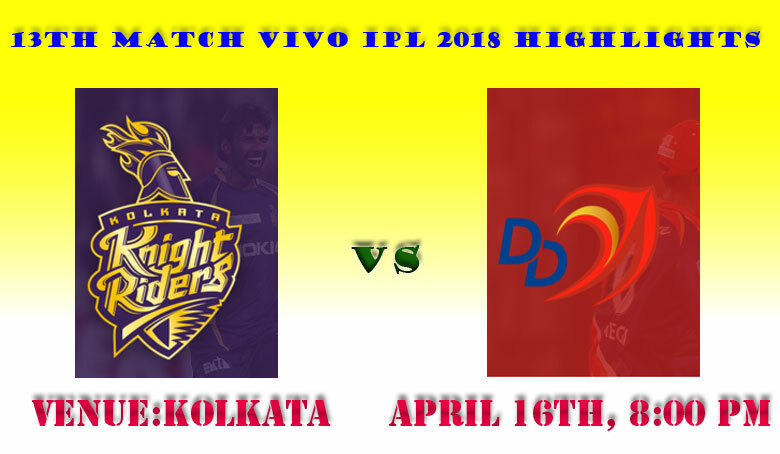 Kolkata Knight Riders beat Delhi Dare Davils by 71 Runs.Sunil Narine (3/18) and Kuldeep Yadav (3/32) ensured KKR kept their cool in the match and never gave the chance to the Delhi side get going. Glenn Maxwell (47) and Rishabh Pant (43) were the only batsmen who gave Delhi a chance. Batting First KKR Scored 200 for the lose of 9 Wickets.Nitish Rana (59) and Andre Russell (41) powered Kolkata Knight Riders to 200/6 in 20 overs against Delhi in the IPL-2018 match at the Eden Garden. The KKR Regulor Striker Robbin Uthappa scored 35 runs in 19 balls. Chasing the big total , Delhi Daredevils loose oppener Jason Roy, who gave victory single handedly out for low score. After loosing early wickts, Rishab Pant and Maxwell build some quick Parnership. Panth Was 43 and Maxwell 47. Sunil Narine and Kuldeep yadav Distroy the DD Innings completely.Sunil Narine (3/18) and Kuldeep Yadav (3/32) bowling figures.